We love The Railsplitters. Too bad most of them were coughing. Watched the Railsplitters in the university library which was the perfect atmosphere! Just Awesome! I would love to see them again. Wonderful show! The concept is a good one but won't take the place of live audiences in a larger venue (I know, I know, that's not the idea.) I wanted so badly to applaud. The sound level could have been a bit higher and maybe another mic would have been nice. Also, perhaps marks could be made so no one is blocked from view. All-in-all?... once the kinks are worked out this will be a great way to showcase talent. What I would like to see is a live feed from a studio recording session. I'll bet there are a lot of people who would be fascinated by seeing what goes into making an album. Please, let's have another show VERY soon! From their home in the Colorado Rockies, The Railsplitters have been scaling new heights with a refreshing and charming range of bluegrass and beyond-bluegrass music. For a debut album, The Railsplitters sound remarkably assured, playing with the kind of abandon their live shows are known for. Bringing real depth and formidable talent, this group draws influences from all the greats--from Bill Monroe and Earl Scruggs to modern groups like Uncle Earl and Crooked Still. The Railsplitters are nothing if not enthusiastically bluegrass and contagiously so, with rapid tempos, unusual instrumentals and good-time breakdowns! Using powerful female and male vocals, enchanting harmonies, and masterful instrumentals, The Railsplitters have the kind of raw power that can raise mountains and even a few eyebrows. The Railsplitters' debut album starts off with a nostalgic homage to lead singer Lauren Stovall's hometown of Jackson, Mississippi, "The City With Soul." As a singer, Lauren has certainly got soul, and plenty of it! And while Lauren is giving Alison Krauss a run for her money, Peter Sharpe and Dusty Rider are masterfully pickin' the mandolin and banjo (respectively). Lauren, Peter, and Dusty, along with innovative upright bassist Leslie Ziegler, all sing on the album and add to The Railsplitters' impressive songwriting. The quartet usually start by writing their songs individually and then come together to develop them as a group. This songwriting interplay adds a special addition to an already broad diversity of styles and genres on the album. From dance numbers like "Lonesome Feeling," to modulated instrumental numbers like "Longs Peak," to sweet ballads like "Where You Are," The Railsplitters have a song for every kind of mood. 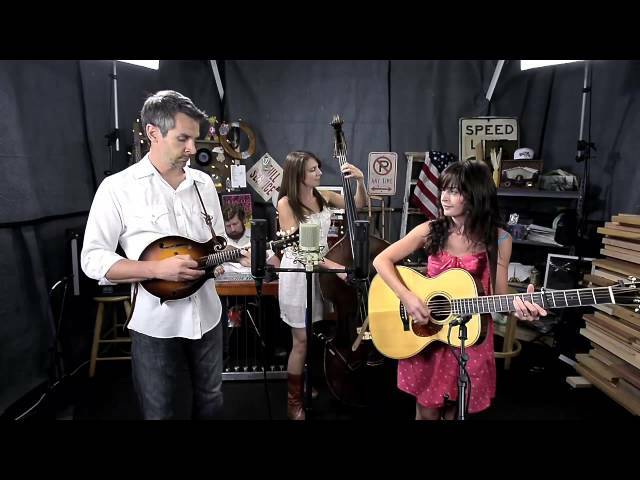 The Railsplitters have a musical range that sets them apart from other up-and-coming bluegrass bands. Calling on genre influences from Roots/Americana, Country Twang, 50's doo wop, modern pop, and of course, good ol' fashioned Rock 'n' Roll, they've been wowing listeners at home in Colorado and beyond. Since their beginning in early 2012, The Railsplitters have won two major contests: 2012 Pickin' In The Pines in Flagstaff, Arizona and 2013 Rockygrass in Lyons, Colorado! At the core, The Railsplitters are a high energy, bluegrass roots quartet whose vocals soar well above all the blue in the sky. With luminous vocal clarity, unclouded songwriting talent, and exceptional musical range, this high energy group will be growing far beyond Colorado's Front Range in no time!